This blog is almost one year old—it began on May 13, 2009—and with its first anniversary comes new focus. The project that started as a personal journey has taken on a more formal purpose and an official name—Aurora Branch History Project. 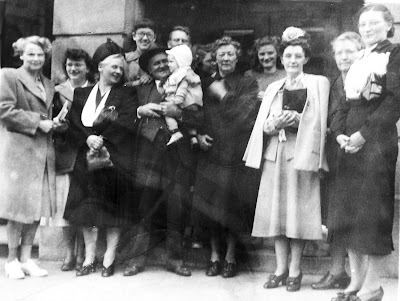 Soon it will also have a logo that will most likely include this photo of branch members posing in front of the entrance to the Odd Fellows Hall in 1948, near the mid-point of branch history. Front, l to r: Ardis McCarty, Nancy McCarty, Louise Williams (visitor from Chicago), James T. Greer holding grandson Tom Erekson, Myrtle Greer, Cora Hall, Grace Erekson (visiting from Utah), and Ilda Fuller. Back row: Louise Erekson, Jimmie Greer, Mary Jane Greer, and Patty Ward. Although I have not posted to the blog in more than six weeks, I assure you that during this time I have spent more hours than ever on research and the organization of research files. I thank all of you for your patience with the unexplained hiatus. Also in the past few weeks I have designed a standard form for cataloging the information that I am compiling on each member. I’m sure the form will be modified going forward, but for now it contains time and place of residence in Aurora, occupation, some genealogical information and names of family members, activity in the branch, photos, commentary, current contact information (for the member or descendant), and a list of resources consulted. This standardization has already been a great help in organizing my somewhat haphazard files. I renew my request for you to share photos, anecdotes, and genealogical information about the Aurora Branch, and I emphasize that the branch members and their descendants may request copies of my files at any time. Preserving and sharing information always has been ultimate goal for compiling this history. There will undoubtedly be many ways to share the information over time. For instance, this coming September I will be presenting a paper relating to the Aurora Branch at a conference of the Community of Christ Church (Reorganized LDS) in Rockford, Illinois. Eventually all the research materials and the Aurora Branch artifacts that I inherited from my grandparents will be donated to the Church History Archives in Salt Lake City. I look forward to continuing this journey through history and I invite you to accompany me as we get to know the fine people who were dedicated members of the Aurora Branch.